Cornered by Technology: The TEL Teams first newsletter! 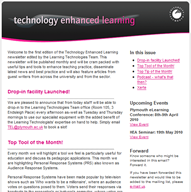 The first TEL newsletter has arrived! :D Most of you in UoP should have received this, but if you didn't please contact the team on TEL@plymouth.ac.uk. *Central TEL Team drop in facility (Room 105, 3 Endsleigh Place), Please contact for bookings. *How to compress images in PowerPoint! *Xerte - a new system to create your own TEL the easy way! *Student in class voting system - TurningPoint. Thanks also to Sid White (Learning Technologist) for equipment loans! Plus Dr Shirley Atkinson and students featured in this demo.